real quick, using an electric mixer. After I made the composition, I took out about 2-3 spoons and put it in another bowl. To this composition, I added 1 spoon cocoa and mingled it well. 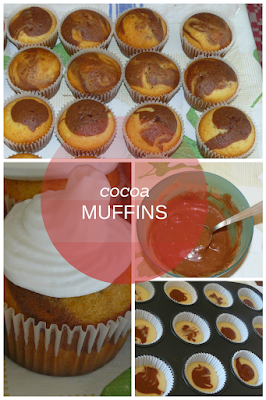 After I put the first composition in the muffin tray, I put a half teaspoon of the cocoa composition. In this point, you can play with a fork to mingle the two compositions, or you can just leave them as they are. It`s really your choice. I left them to bake for about 15 minutes, and they were done. 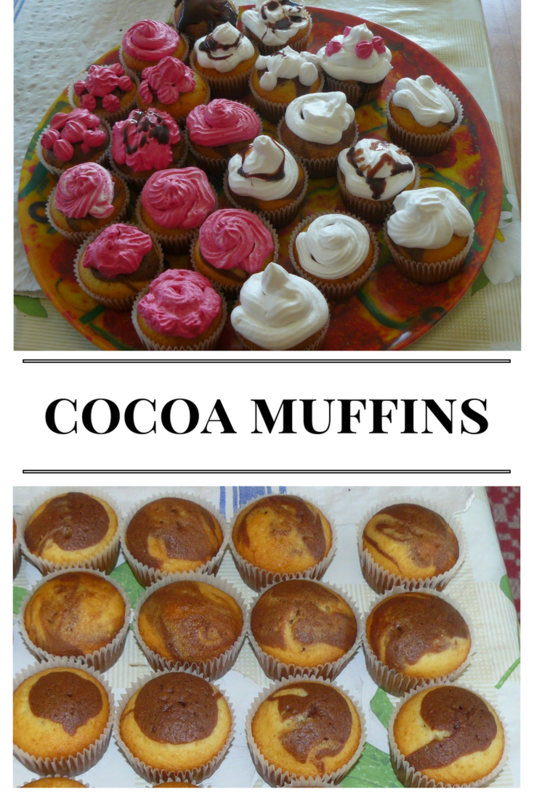 For the frosting, I just used some whipped cream, and some pink whipped cream, just as I used it on the simple muffins. The result was great! And my friends loved the muffins. 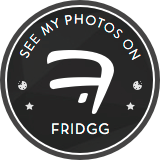 Don`t forget to pin/share if you liked it! Please join us for these amazing parties, find them right here . i love the marble effect, and the pink frosting is so festive! mmm these look delicious! I love going to a friend's house and they have freshly baked goodies. Looks like an easy and tasty recipe. These look so scrumptious!! Thanks for sharing! Oh yum. My girls would polish these off in a day. Your muffins look lovely! They would be a welcome treat with a cup of tea. Thank you for sharing with us at Hearth and Soul! Those sound nice and easy! They look delicious! Thank you for sharing at Link It Up Wednesday! Wow - these are beautiful and sound tasty! I'd love it if you shared this post the the What's for Dinner link up! Thank you for your kind words and for the invite! I will surely visit your party. Those look great, especially with the pink icing! 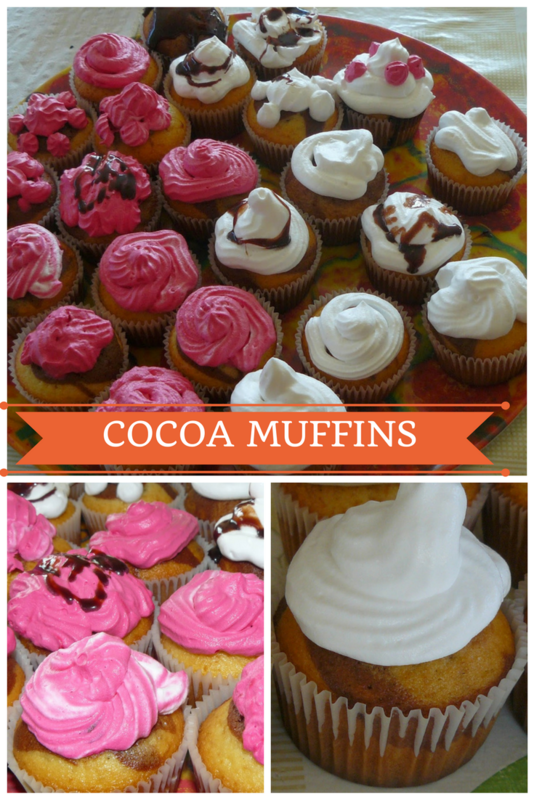 Love muffins, always will and these look great. We would call this cupcakes in the States. They look delicious! I love mine with lots of frosting. They look so cute. It's been so long since I last made cupcakes. I should do those some day. All the muffins! they look so good and are making me so hungry! i love baking! i could try these! Great idea! Something easy to whip up when you have guest and tasty too. Those muffins are looking great by the way. They look so so delicious. I love going through your recipes, they look so simple. Thanks for sharing this one. 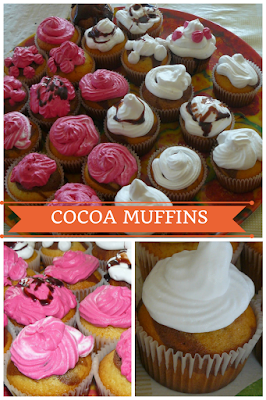 I wish I had your talent for decorating cup cakes, these look amazing and delicious too! Yummy!They look delicious! I love this recipe.Thanks for sharing this one. I bet the muffins were delicious. They are so easy to make and the pink frosting looks so pretty on them too. A perfect dessert to make when you have unexpected guests. 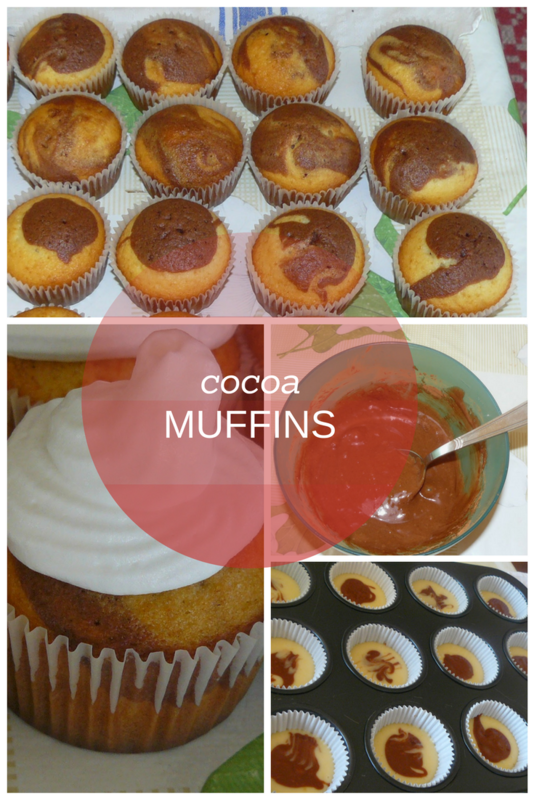 Oh wow, I love muffins and these cocoa muffins look awesome! This would definitely make an amazing treat! these muffins looks amazing! i really like that you decorated them, i wonder if i can make them gluten free? Of course! You just need to change the regular flour, to gluten free flour. The taste will be amazing! Bless you! These are all heaven and their making my mouth water. These look so yummy! Can't wait to make them! Since they have icing on top, does that make them a cupcake? Looks yummy either way!